For some users, it’s a life-saver. For some, it’s a ‘just in case’ feature. Either way, Switch Invitations can make a major difference. 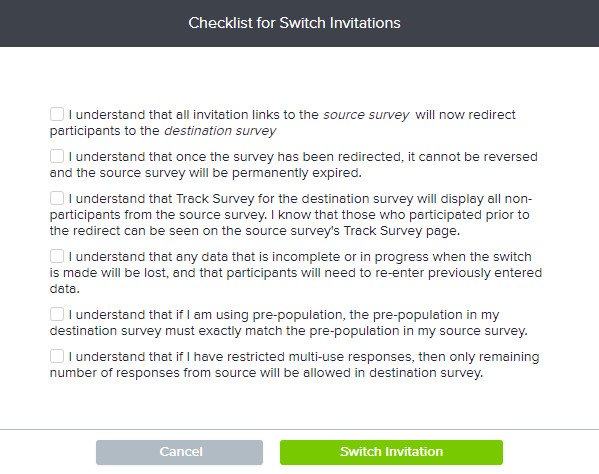 If you launch your survey and later realize you forgot to add one critical question or branching rule, use Switch Invitations. Participants will use the same link or invitation but will be redirected to the new, fixed survey. Within the platform, you’ll copy your ‘source’ survey and made the appropriate changes to your ‘destination’ survey. Participants will never know the difference. In the top right corner of the screen, click on the Utilities button. On the Utilities page, select Switch Invitations. Select the Source and Destination surveys. Review and agree to each item on the checklist. Remember that this switch cannot be undone.